Trying to figure out if you should get the Vitamix 5300 or the 6300? A detailed chart on the important features of both the 6300 and 5300. What's important about each and what's not. Which blender you should buy based on 7+ years of blending knowledge. Mobile users can scroll left to right to view entire chart. Let's break down the features of each blender and talk about how they apply in real-world blending. The 6300 has a 2 HP motor while the 5300 has 2.2 HP. Obviously, this chalks up as a win for the 5300. It's not that you won't be able to do the same exact things in each respective blender, but the 5300 will have a slightly easier time. You'll feel a bit less resistance when you're doing it. Don't worry, though - if you do get the 6300, you'll still be able to make all the hot soups, smoothies, batters and ice cream that your heart desires. 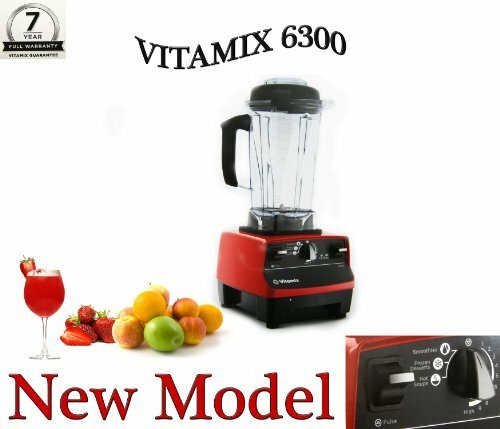 The 6300 has a smoothie, hot soup, and frozen dessert recipe built into the blender. These allow you to walk away while the blender does it's thing. The 5300, doesn't have any of these, but again, you can still do the same things. You have to mind the blender and work the knob, but your smoothies will come out exactly the same. These functions are useful on the 6300 if you have an exact recipe down. That way you could set it and forget it. But the problem is, there are so many better models out there with pre-programmed settings now. The Ascent or Vitamix 780 model has much better functionality if that's what you're looking for. Winner: Vitamix 6300 - slightly. The 6300 only comes in black while the 5300 comes in black and red. There's no clear winner here, because obviously colors are subjective to your style. The 5300 has the wide 64 oz container while the 6300 has the classic 64 oz. Each container has it's own specific set of advantages. Wide container: The wide container is nice because it can easily sit under a low-hanging cabinet. There's about a ~3 inch shorter height difference with the shorter container. Be sure to consider this and how it will fit in your kitchen. You'll want to leave your Vitamix out on the counter, so it's worth taking into account. It's also excellent at getting a vortex for large batches of ingredients. Because the surface area is so large, food gets sucked right in rather than sitting on top and requiring you to bust out the tamper. Narrow Container: The narrow container has the disadvantage of being harder to fit in small spaces. Since it's quite tall, it's a common issue that it will bump into cabinets. On the other hand, it functions slightly better if you're making smaller batches. This is because you don't need a huge volume of ingredients to form a vortex. A narrow container almost functions like a small, personal-sized blender like a Nutribullet at the bottom. However, with larger batches you're more likely to have to use the tamper. Winner: Vitamix 5300 for larger batches - Vitamix 6300 for smaller. However, you can buy a smaller container (32 oz) for the 5300 which is helpful. 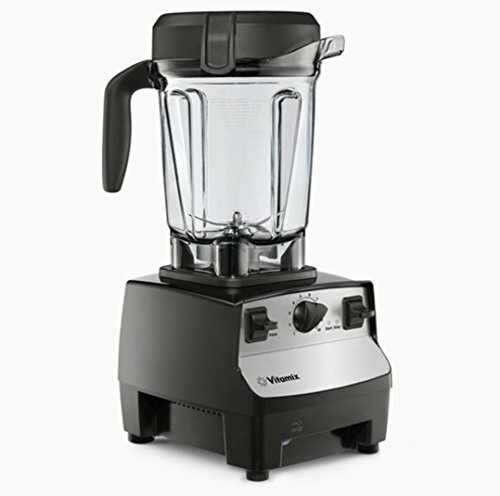 Because of the jar sizes, the Vitamix 5300 has a larger set of blades. It's simply a product of the container. It doesn't really make a difference in terms of function - other than the batch size difference which was described above. Winner: It's a Draw (see above). Both the 6300 and 5300 come with the well-known Vitamix tamper - whether it be for the tall or wide container. Either way, they're both excellent. You don't have to worry about ingredients getting stuck on the sides, or not being drawn towards the blades. Simply tamp, tamp, tamp and you're good to go! Both units come with the same Vitamix 7-year warranty. If you weren't aware, the service that Vitamix offers is excellent. I've had several repairs on my unit over the years and it hasn't cost me a dime. The customer service team was friendly and shipping was paid both ways. At this point, the 6300 is a retired model. I wouldn't recommend it over the 5300. The 5300 is an excellent pick, especially if you decide to save some money and get it refurbished for a slightly shorter warranty. Check prices on a refurbished 5300 here. While it does have some pre-programmed settings that are nice, there are many other models you can get that do that better than the 6300. The technology on it isn't even close to the Ascent series so I'd rather just get the basic features of the 5300. Unless I could get a super great deal on the 6300, I would pass on it in favor of a different Vitamix. See our guide on blender types and top picks here.